Landfill gas (LFG) is produced when microbes decompose garbage in a landfill, most of which occurs anaerobically or in the absence of oxygen. This process generates roughly equal amounts of methane and carbon dioxide. Methane is a powerful greenhouse gas, with a global warming effect 21 times greater than carbon dioxide. The RDN has introduced several innovative technologies to collect, monitor, reduce and eventually utilize LFG emissions at the Regional Landfill through its LFG Management Plan. This has resulted in reducing annual greenhouse emissions from the landfill by roughly 21,606 tonnes of carbon dioxide equivalent. In 2002, the RDN received a $500,000 grant from the Green Municipal Investment Fund to expand the Regional Landfill’s LFG collection system and increase LFG recovery by 65 per cent. The LFG gas collection field consists of 30 vertical extraction wells, two horizontal extraction trenches and a network of collection piping. A centrifugal blower creates a vacuum to extract the LFG from the collection field. An on-site monitoring program monitors and analyzes landfill gas at the Regional Landfill in accordance with BC Ministry of Environment guidelines and WorkSafe BC requirements. The LFG monitoring program determines the volumes of LFG collected and destroyed. Sampling and monitoring is critical to maintaining the effectiveness of the LFG collection and treatment system. 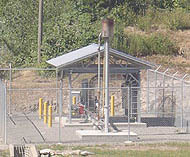 Methane collected at the Regional Landfill is currently burned at an on-site flare station to reduce greenhouse gas emissions and other impacts such as nuisance odours. The RDN has entered into an agreement with Cedar Road LFG Inc., which is constructing a facility at the Regional Landfill that will use methane collected to produce electricity. The electricity generated at the Regional Landfill will be fed into the BC Hydro power grid. It’s anticipated that plant operated by Cedar Road LFG Inc. will produce 1.5 megawatts of green power, sufficient to supply 1,200 homes. The RDN has constructed an interim cap along the Regional Landfill’s east slope. Completion of the cap in the area no longer receiving waste will generate several environmental benefits by reducing greenhouse gas emission and leachate caused when water filters through garbage. The landfill capping project uses a multi-layer system to contain landfill gases, improving LFG utilization and reducing pollution. By acting as a lid, the cap reduces oxygen intake, contains landfill gases, and minimizes water infiltration. An organic biocap, one of the first of its kind to be installed at BC landfill, promotes the growth of methane-consuming bacteria for methane that infiltrates the cap. Field studies are being conducted to evaluate the effectiveness of landfill capping project in containing subsurface methane and reducing ambient methane emissions. Landfill equipment is now powered by biodiesel. Diesel-powered equipment at the Regional Landfill and Church Road Transfer Station have now switched to an ultra low sulfur biodiesel fuel blend, reducing both tailpipe and greenhouse gas emissions. Nanaimo Regional Transit is supplying the biodiesel fuel blend to the RDN Solid Waste Facilities through its participation in BC Transit’s biodiesel program. No modifications to the diesel-powered compactors, loaders, backhoe, and mower in use the Regional Landfill and Church Road Transfer Station. The equipment consumed 155,418 litres of diesel fuel in 2006 and the cost of using biodiesel will be the same or less than regular diesel fuel. The energy used to make products that are consumed then disposed of as garbage contributes to climate change. The RDN was among the first in Canada to adopt a Zero Waste approach to eliminating garbage and creating a more sustainable region. By reducing, reusing and recycling, residents and businesses in the region now divert more than 55 per cent of their waste from the landfill, reducing the demand on energy and resources. The RDN has targeted a 75 per cent diversion rate by 2010, a goal that will be realized through the region’s Solid Waste Management Plan. The RDN has banned materials such as drywall, recyclable cardboard, paper, metal and tires from disposal in the Regional Landfill to divert them to recycling facilities. In June 2005, the RDN banned commercial food waste from the landfill as the first step in an organics diversion strategy. Now instead of being landfilled, more than 4,000 tonnes of commercial food waste is supplied annually to a licensed composting facility in the region where it is made into a beneficial soil enhancement. Furthermore, studies have shown that every tonne of food waste diverted from the landfill results in a nearly equal reduction in greenhouse gas emissions. Later this year, up to 2,000 households in the region will participate in a residential food waste collection pilot project to determine the costs and the diversion potential of removing this material from the waste stream.